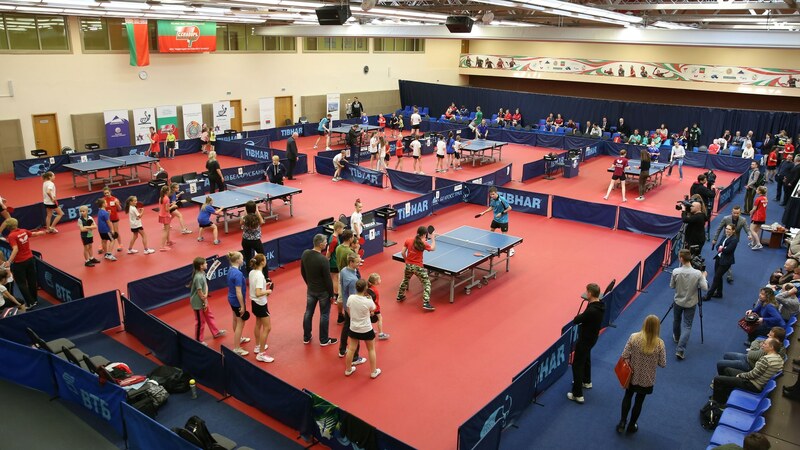 The 2017 World Table Tennis Day celebrations were apparent in Belarus on Thursday 6th April with several activities taking place at the Olympic Training venue as local people came together for a fun day of table tennis. While the event may have taken place during a busy weekday the attendance was promising, and there was a good media presence at the venue as well. Throughout the day there were special activities for the visitors to participate in with plenty of prizes up for grabs. Also at the event was former Belarus player Veronika Pavlovich who now holds the role of Belarus Master of Sport and National Team Coach. Pavlovich at one point during the day took part in a friendly match against Shanyukevich Victor Abramovich (Deputy Chair Belarus Table Tennis Federation, Associate Professor Belarusian National Technical University, Soviet Union Master of Sport) with the latter of the two prevailing by a 5-3 scoreline. With the day drawing to a close the visitors were invited to take on player and coaches who represent the Belarus National Team further demonstrating that table tennis is a sport for everyone regardless of the individual’s level.